Dr. Heidi Weiskel (at left) poses with staff at the law and Policy of Sustainable Development Research Center (LPSD), Hanoi, Vietnam. 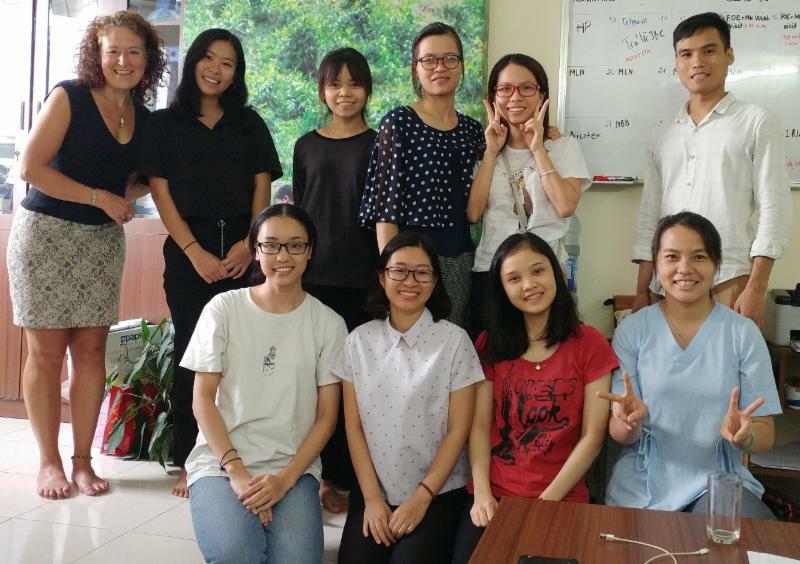 ELAW Staff Scientist Dr. Heidi Weiskel recently returned from Hanoi, Hue, and Ho Chi Minh City, where she collaborated with ELAW partners at the Law and Policy of Sustainable Development Research Center (LPSD) to protect coastal ecosystems. She also taught at the Climate Change Summer School, hosted by the Berlin-based Independent Institute for Environmental Issues (UfU) and the Mientrung Institute for Scientific Research. 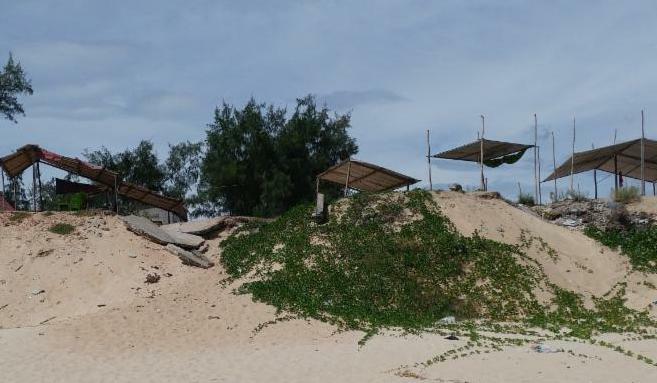 Homes in Phu Than, near Hue, abandoned by owners due to sea level rise. "On a field trip with my students from the Climate Change Summer School, we learned that in the last 30+ years, the waters off the coast in central Vietnam have come inland a full kilometer. Standing on a levee looking out at the seemingly tranquil East Vietnam Sea, it was hard to imagine. But waves are eroding beaches too quickly for communities to do anything but evacuate. The government has been assisting in relocating people, but it has been terrible for communities that must break local ties, upend their lives, and find new ways to make a living in completely unfamiliar surroundings. We met with Đặng Văn Tuỳ, President of the Phu Thuan commune People's Committee near Hue. He explained to us that in his community of 10,000 residents, 210 households have already been relocated (see photo), and the sea will not stop coming. I was inspired by both the staff at LPSD and the participants in the Summer School. Coal-fired power plants are an enormous threat to the global climate. LPSD is working with communities threatened by new coal-fired power plants. LPSD wants to ensure that communities have the scientific information they need to understand the true impacts of coal-generated power and advance efforts to promote clean, green energy. The participants in the Summer School were equally inspiring. They came from all over Vietnam -- some from vulnerable island communities, others from universities and NGOs. They arrived knowing quite a bit about the impacts of climate change, and they asked good, hard questions during the session I co-led on coastal climate change with Pham Van Tan, Deputy Director of the Department of Climate Change within the Ministry of Natural Resources and the Environment (MONRE). I am grateful to our Vietnamese partners for their incredible, brave work and for taking such good care of me during my trip. I look forward to ELAW's continued work with both LPSD and the Climate Change Summer School."